This photo was taken on my desent from Grosse Scheidegg 13/06/05 the day had every weather combination you could think of, from hot sunshine to an electrical storm of grand proportions with large hail stones! I found out why the Wetterhorn is so called, it wasn't seen until after the storm retreated, as had I !! The Wellhorn is on the right with the sadly retreating Rosenlaui glacier. 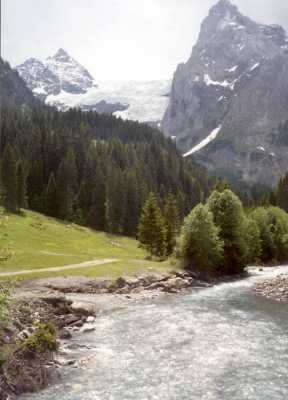 The track on the left of the River Rychen was my companion for hours of walking in such exhilerating scenery.